At 11 a.m. local time November 1st, more than 20,000 Google employees walked out of their offices to protest Google’s history of protecting its employees who have been accused of sexual harassment. The walkout was sparked by the $90 million settlement given to Andy Rubin, the founder of Android, after charges of coercion were found relevant by Google. Upon exit, Rubin received this money and created his own successful company–which in no way punished him for his seriously questionable actions. This, however, was not the first time. In an interview with an anonymous Google employee, I was able to hear firsthand what the walkout was like among other sentiments. Boland: What was the walkout like? Boland: How did the executives at Google react? Boland: How did you feel? Boland: Do you feel safer at work after the walkout? I was extremely lucky that the above Google employee responded so openly and honestly when asked specific questions, as well as painting a descriptive picture of the walkout and its effects. 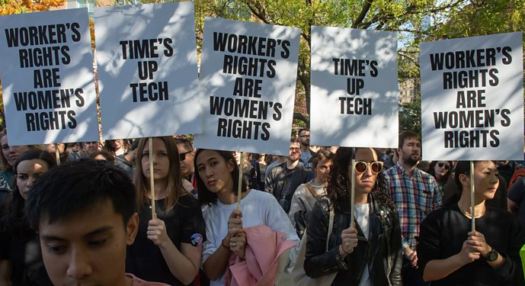 Clearly, sexual assault in the workplace needs to be brought to light everywhere, as sexual assault happens much more than we think–Google employees are the first to widely protest and receive such a supportive response from executives.